Dave Coplin is an expert on topics surrounding the Future of Work and our Relationship with Technology. Dave helps organisations to see the full potential that technology offers a modern, digital society. He focuses not on the technology itself, but on the humans who use it. Dave has a tell-it-as-he-sees-it style, enthusing and entertaining his audiences, helping them to think differently and creatively. His mission is to make people reconsider their relationship with technology and how it can help them work smarter, not harder. 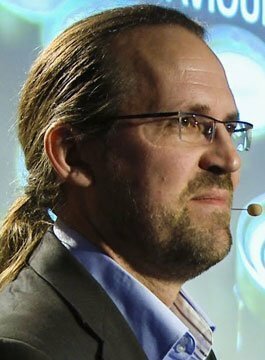 With over 25 years in the technology industry, Dave Coplin is now Principle Tech Evangelist at Microsoft. Dave is at the forefront of conversations around how individuals and organisations can benefit from the transformational potential that technology offers, rather than simply using it to do the same things, but only slightly better. Bringing some much-needed new and exciting thinking to the ‘future of work’, Dave’s books Business Reimagined and The Rise of the Humans discuss the need to re-think how we use technology to make it work for us, not against us. The Rise of the Humans shines a light on a cultural phenomenon threatening to overwhelm us – the deluge of digital information which surrounds us in work and in life. Dave argues that the sheer volume of information often prevents us from ever going deep into subjects, and constrains us from getting the much-needed headspace to think. He claims this deluge often leads us to snack on data in a way that’s unhealthy for our minds, working styles and, most importantly, our lives. Dave’s work as a published thought leader has allowed him to start a new conversation with audiences that resonates broadly at all levels within organisations and individuals about the changing nature of work which requires even greater levels of flexibility, collaboration, creativity and innovation. Dave is a prominent and regular voice at leading industry events including the RSA, WorkTech, and Cloud World Forum. His RSA Animate video on the need to ‘re-imagine work’ has generated over 800,000 YouTube hits to date. Addressing the intersection of modern society technology, Dave is spearheading the development of the UK’s IT and digital industries by helping people to understand and aspire to greater outcomes from our use of technology. As an industry authority, Dave Coplin is a regular media contributor on topics including the future of work, Artificial Intelligence, the future of education, privacy, on-line safety, big data and the impact of Machine Learning.